What a year… what turmoil of emotions … what renewed determination. At first it was elation. At long last we saw it happen. We saw our people stand up for their rights. After decades of being disparaged, harassed and made fun of, Egyptian civil society – small groups working on issues such as human rights, freedom of information, and poverty – were joined by tens of millions of people, across the country, demanding freedom, social justice and dignity. Instantaneously, we forgot the era when we were labelled as spies, mercenaries, or at the very best naïve; we “disremembered” the State Security’s harassment and invasion of privacy, and we rejoiced at a dream come true. Then, it was bewilderment. Why, we asked, is nothing changing? Why is the Egyptian Prosecutor General – who was the direct appointee of Hosni Mubarak still in his position? Why is he the one we have to ask to freeze the illegal funds of the Mubarak family and their cronies? Why is he still the one entrusted with implementing the United Nations Convention against Corruption, which Egypt ratified in 2005? Wasn’t he the one who adamantly refused to allow civil society to monitor its implementation? How come he is the one entrusted with prosecuting Mubarak and his corrupt regime? Followed by incredulity. Why are there still tortured prisoners? Why are there military trials for the civilians? Why are they murdering peaceful demonstrators? Why didn’t they pass the Freedom of Information Act? Why did the Prosecutor General not send the necessary requests to freeze the illegal funds of Mubarak and others? Why is the military demanding special status in the yet unwritten Egyptian Constitution? Why is the Military storming the offices of non-governmental organisations? Which hardened into conviction and determination. The Military are trying to steal the Egyptian people’s revolution. But it won’t wash. Too many have died, too many have lost their sight or were disabled … this time the people shall prevail… Lack of progress has only served to renew our conviction and determination. 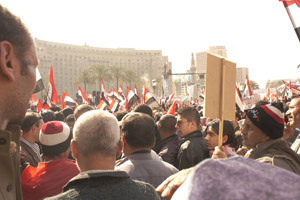 The many factions of Egyptian civil society united once again to support the revolutionaries on January 25, 2012. Millions took to the streets demanding freedom, social justice and dignity and chanted “Down, Down with the Military Rule”. We pledged not to leave Tahrir Square until our demands have been met. We do not feel the same elation as we did on the day Mubarak fell. Perhaps we are wiser now. But we know what the power of the people can do and it is this knowledge which will keep us going until we achieve the Egypt we all want. See our Open Letter from INGOs working in Egypt about the crackdown on civil society from 15 February 2012. Engi M. El Haddad is the director of AEHRO, an Egyptian organisation fighting for human rights and against corruption.